Many thanks to all who have sent feedback through to me over the last few days. It's incredibly valuable to me to know what is and isn't working for you all. 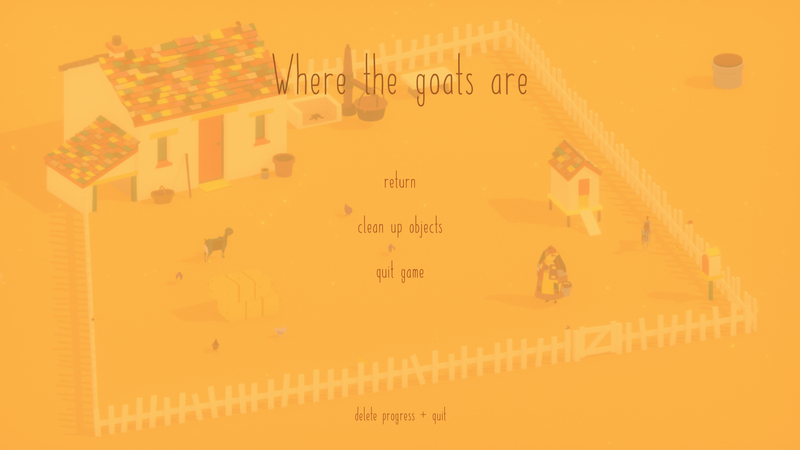 Two of the most prominent gripes people have had with the game is when objects get stuck behind geometry and forced to restart the game, and accidentally selling a goat. I have just uploaded version 1.0.2 which fixes both of these. A menu screen has been added which can be accessed by pressing escape, with buttons to reset the position of objects, quit the game and delete progress. Pressing f12 will no longer immediately delete local save data and quit the game. Also a warning has been implemented letting players know they are about to sell a goat and asked to confirm. So if you've been affected by any of these bugs and even if you haven't, please download the latest version 1.0.2 for the best experience. Note: any progress saved from version 1.0.1 will carry over to this version. Select "delete progress + quit" from the menu to start from scratch.